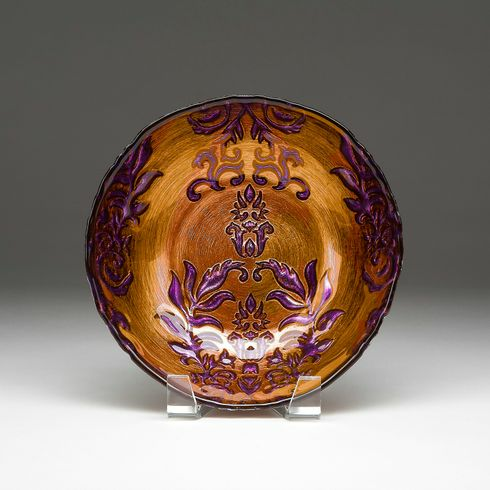 Damask Copper Purple bowl 8"
Home > Tabletop > Dinner plates, Charger Plates, Canape Plates, Tidbit Plates > Damask Plates and Bowls Collection SEE ENTIRE COLLECTION > Damask Copper Purple Canape plate 6.5" SEE OTHER SIZES > Damask Copper Purple bowl 8"
Inspired by the master weavers at the Grand Bazaar in Istanbul using spun glass layered with Silver or gold leaf and organic pigment a classic Damask Pattern in two sizes of Plates and a beautiful bowl are now available from Red Pomegranate. Exotic color and pattern create a rich texture for your table setting. •	Food safe for hot or cold food. •	Hand Crafted Glass plate Gilded with Gold or Silver Leaf •	Hand Wash Using a Spun Glass technique creates a free flowing scalloped edge to this piece.